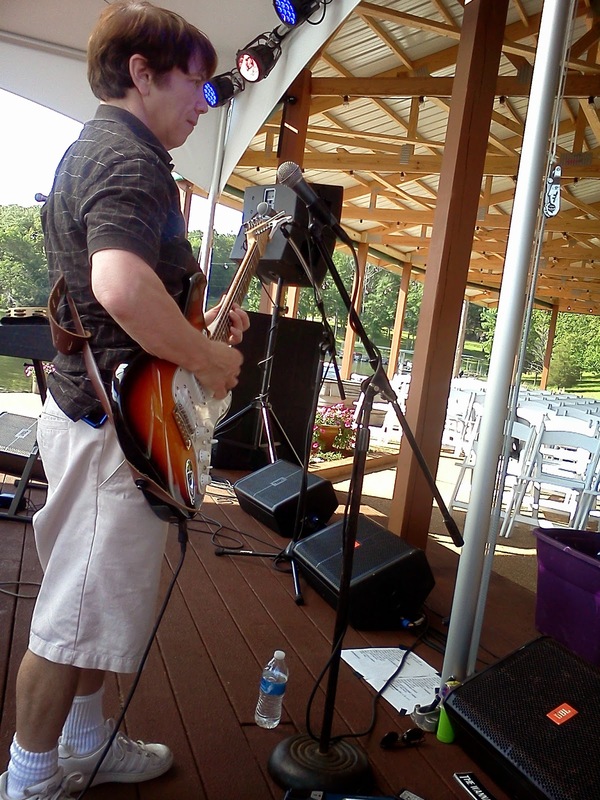 Friday May 30 was the first concert in a new series sponsored by the town of Spring Hill. The movie they showed was "Frozen," the recent popular Disney film that has captivated so many young viewers. 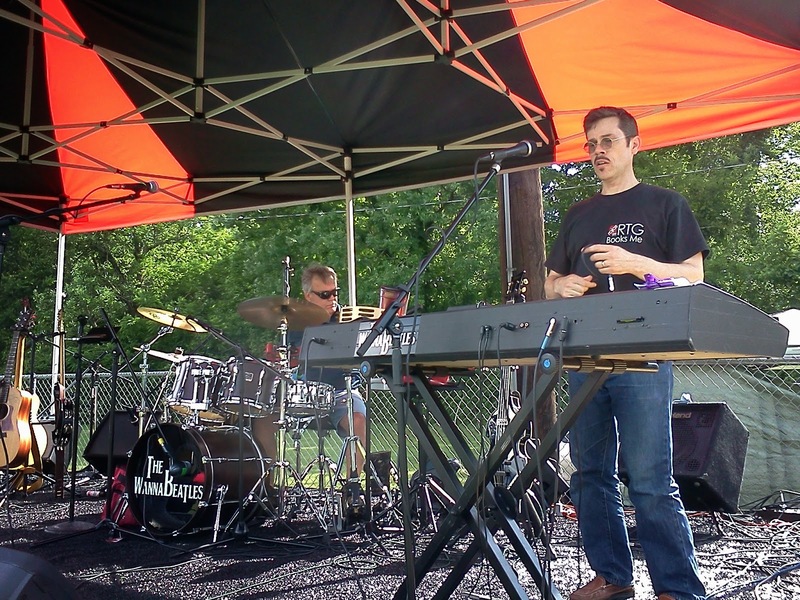 We arrived on a warm afternoon at Evans Field, which had a portable stage on one side, covered with a colorful tent. Beside that was the inflatable movie screen. Around the field were tents from Chick-Fil-A and various other sponsors and vendors. 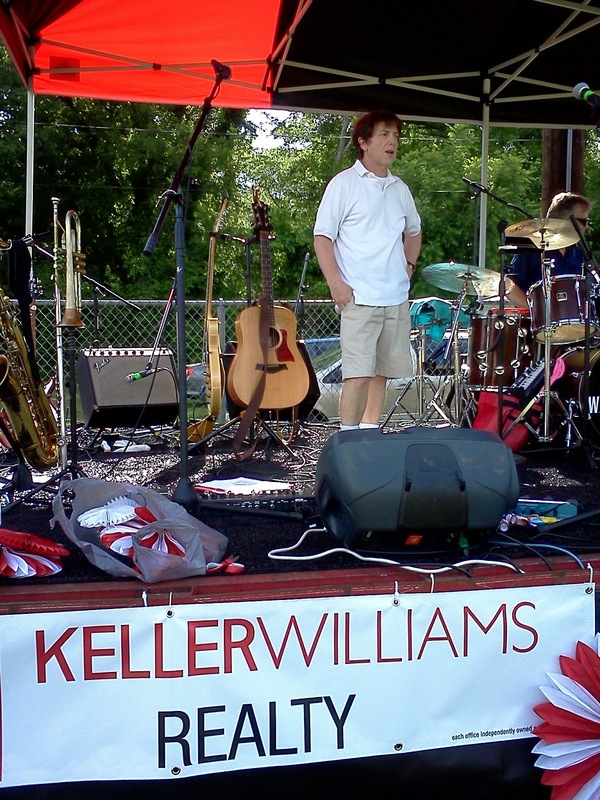 The event was mostly the effort of Keri Price, of Keller Williams Realty, which is the title sponsor of the event. Keri had been keeping us informed and encouraged with emails over the last few weeks. 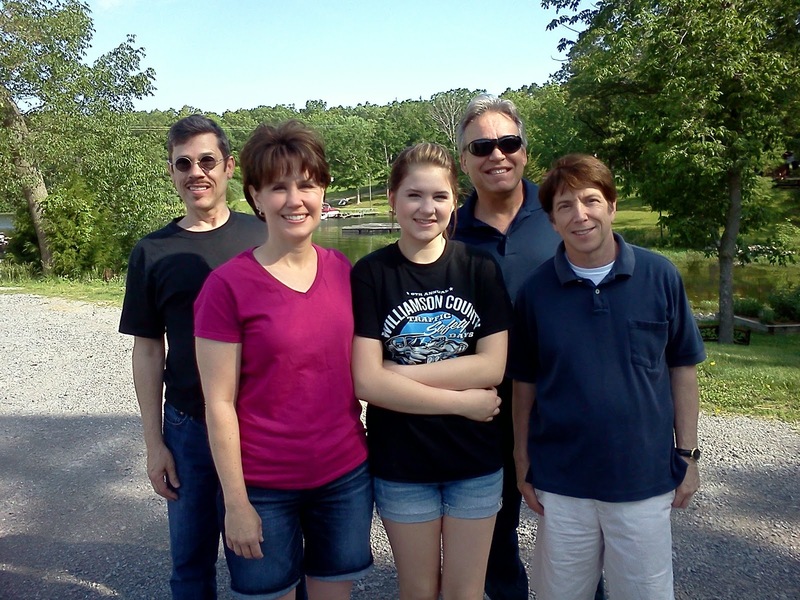 When we arrived, we felt like family friends, because we met Keri along with her husband Steve, a videographer who had worked for WSMV Channel 4 when The WannaBeatles were featured in a brief news item. Steve remembered us from his trip to Dennis's studio for that assignment. And Steve, with his video production company Music Row Video, started working with Keri's dad, famous chairmaker Charles Brock, to produce DVDs about woodworking, which turned into a web tv series "The Highland Woodworker." Keri, Steve, and Charles own and produce that series together. Charles was at the show, and very enthusiastic. He said we could call him Chuck. He told us that he had also been a drummer and a school teacher, and that Keri had shown singing talent at a young age. The fact that it was outdoors put us at the mercy of the weather. We were waiting to see if the predicted rain storm would dampen the evening. After we set up, clouds in the sky gradually got darker and closer, until finally, a full rainstorm overtook us. 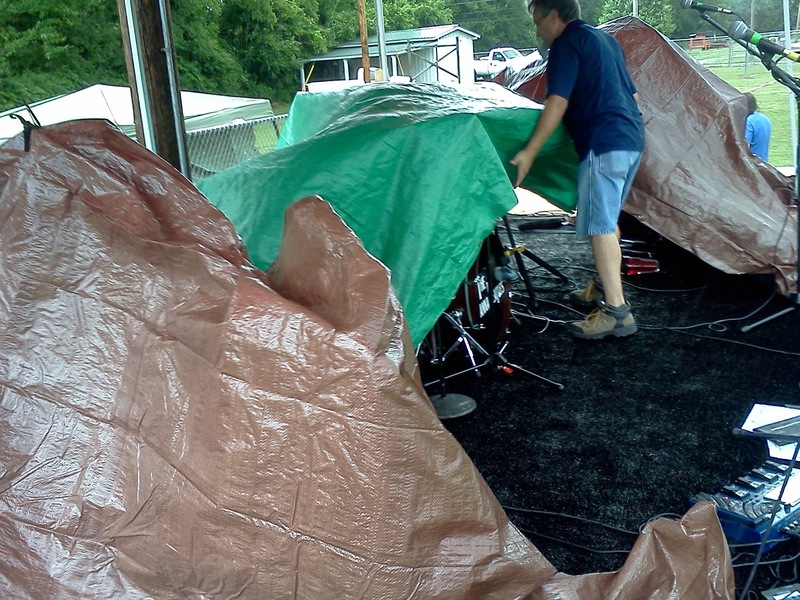 We used the available tarps to cover our instruments. We looked at iPhones to track the weather patterns, noticing that large fronts were headed our way. The rain delayed our starting time by about twenty minutes, but we got into our new summer shirts and everything else went smoothly. 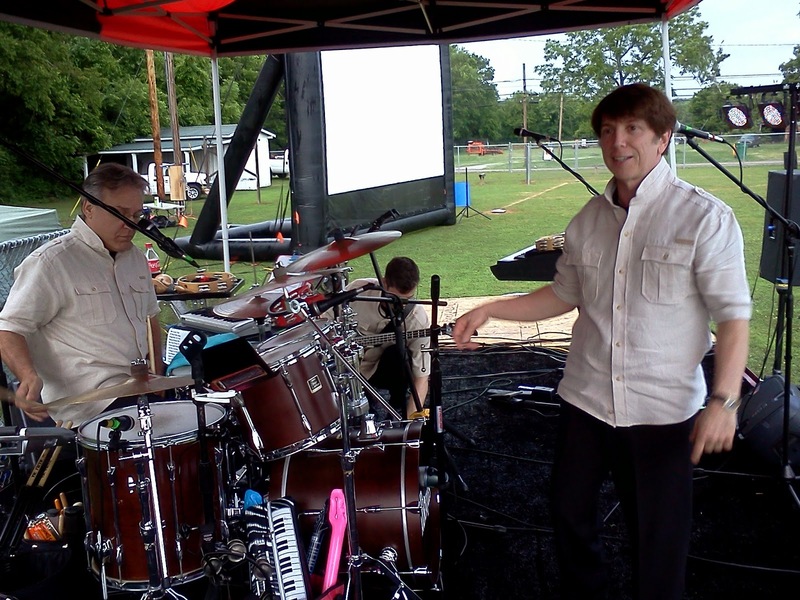 Here we are, back on stage, in our summer shirts, with the movie screen in the background. And a splendid time was had by all. 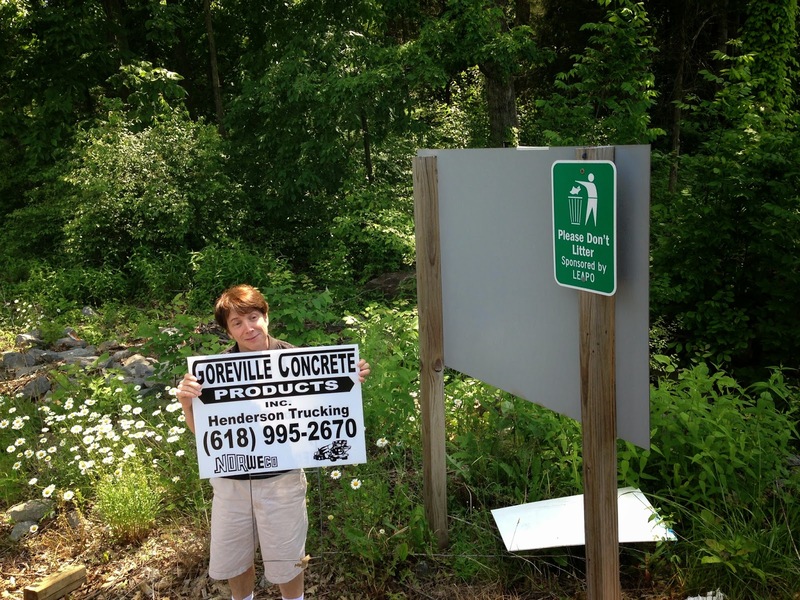 Keri was happy with the first Spring Hill Summerfest, and we look forward to doing it again. 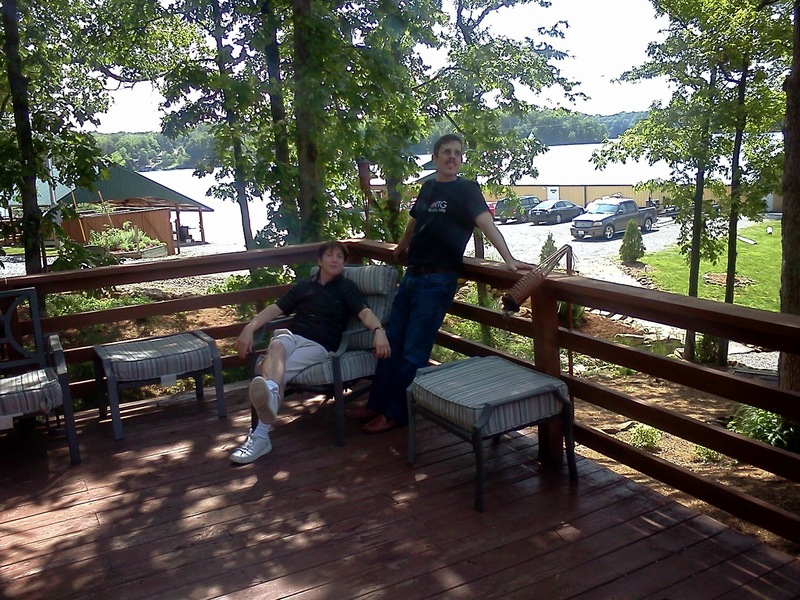 On Friday May 23, the first day of Memorial Day weekend, we gathered at Nathan's and loaded up the WannaVan and UHaul trailer and left for a gig in a place called Egyptian Hills Resort. It was a beautiful sunny day for a drive, and an adventure to a place we'd never been before. It was good to get back on the road again. It brings back memories of all the gigs we did last summer. We already have more gigs lined up this year, so it feels like we're on a roll. We've learned the ropes, how to pack all our gear in the trailer, how to check each other to remember to lock the trailer, how to charge our cell phones while on the road, what snacks to bring along. So we feel like experienced road warriors, and a bright sunny day in May was a good time to remind us of how much we enjoy doing what we do. One indicator of fresh creativity came with Nathan's announcement that his wife Sally had just published her first book. The physical copies had just arrived at their house, and Nathan handed out three to the rest of us in the van, telling us they were not being given to us, but that we could read them while on the trip. 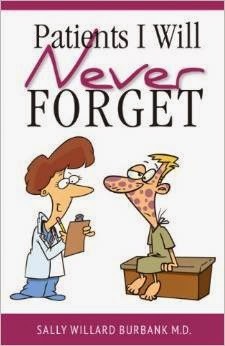 Sally's book is called "Patients I Will Never Forget." It's a collection of anecdotes from her years as a doctor. She's a talented writer, with a distinct comic flair. I started reading and found it so enjoyable I had to pause to read sections out loud to the other guys. 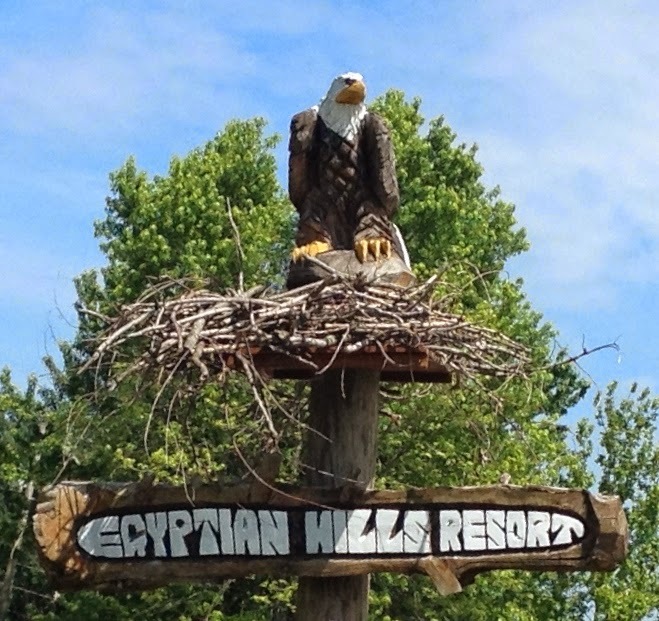 Egyptian Hills Resort sounds like the name of a casino. I imagined a high rise hotel with elaborate gambling facilities. But what we found instead was a very small, rustic, quiet little summer camp getaway way out in the woods. 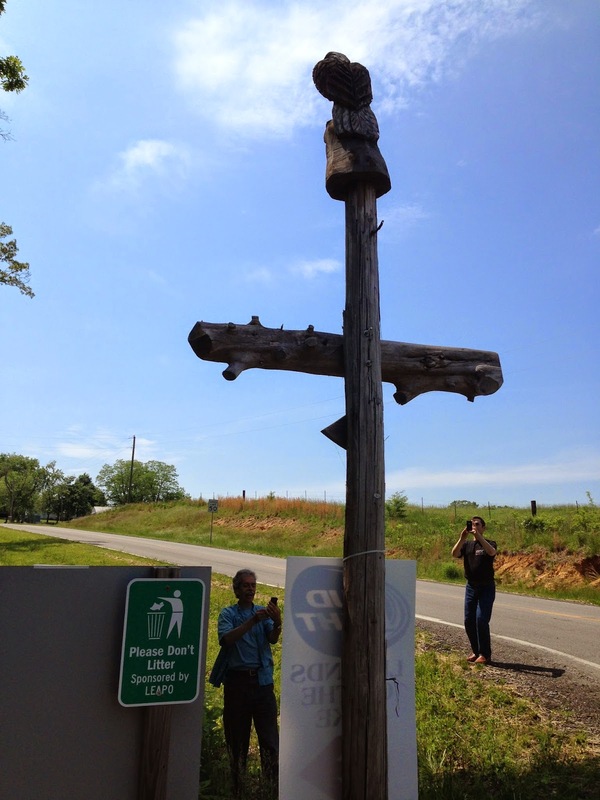 We left the interstate and travelled along small roads, using the GPS for directions. 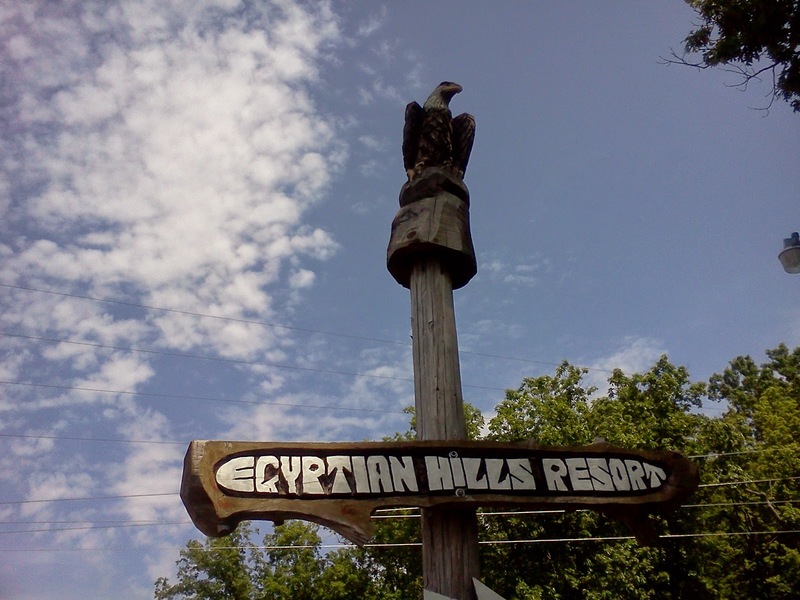 We began to feel lost, until we encountered the signs: large hand-carved wooden statues, bearing the name "Egyptian Hills Resort." Our host, with whom Dennis had been communicating to figure out the details of our performance that night, was named Micah. When we arrived, Micah greeted us and showed us around. 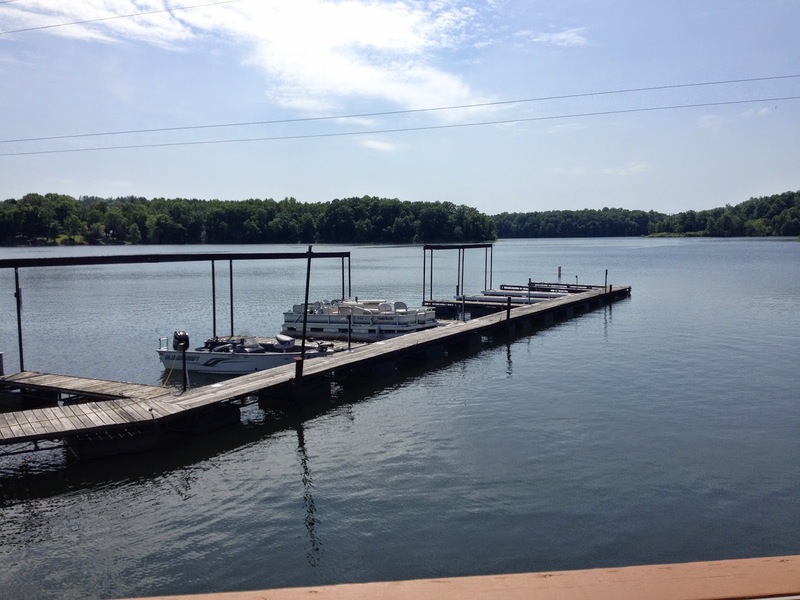 We saw a beautiful lake with several boat docks, and dozens of cozy wooden cabins around it, each one with green tin roof. There was a stage, with a fancy tent over it, at a gathering place which also had an open air restaurant. Micah showed us a cabin where we would stay that night, and told the story of how he had worked to landscape the area by putting in stone pathways and several fountains that pumped water from the lake. 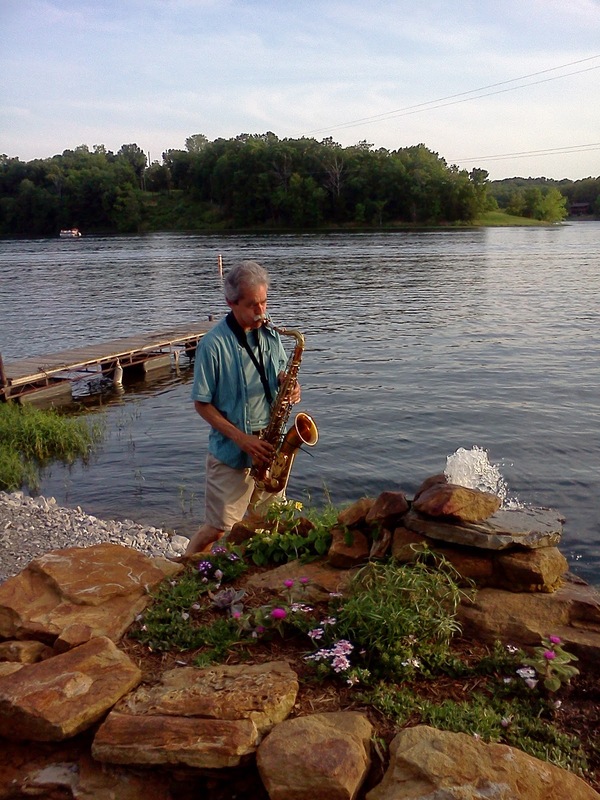 Dennis suggested a photo of me playing sax by what he hoped people would recognize as a "fountain of youth." 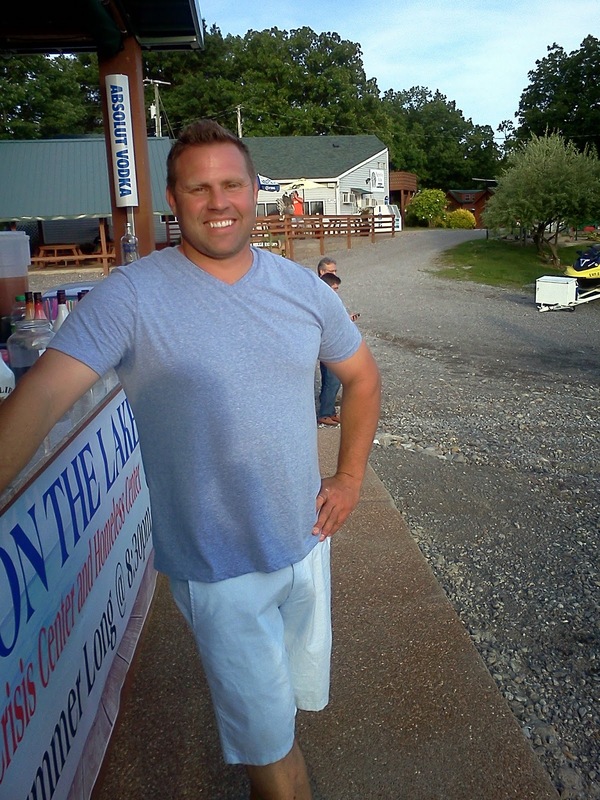 Micah told us he and his business partner had bought the place when it was a humble fishing camp. They completely rebuilt it, with the thirty cabins and fountains and other facilities. 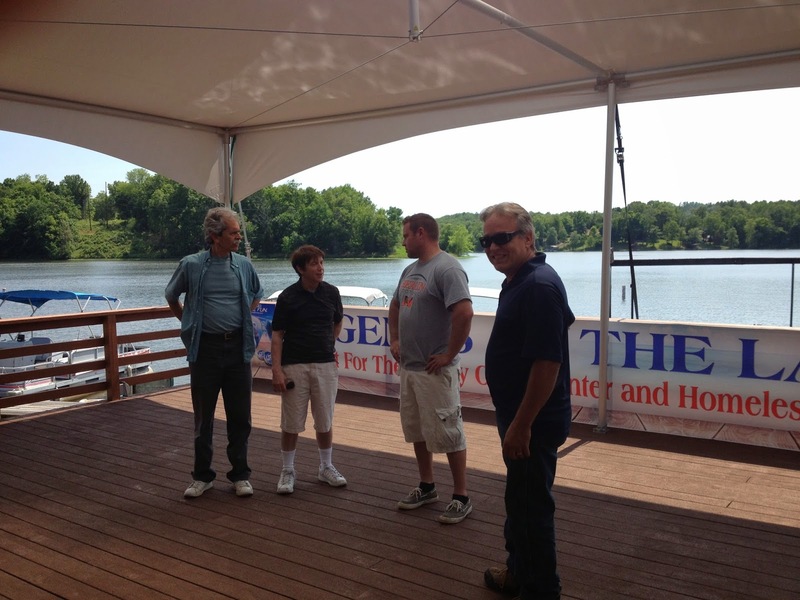 And this year they were starting a concert series at their waterfront stage, called "Legends on The Lake." The WannaBeatles were their first show in the series. These photos are the first time we've published panorama views on this blog - thanks to WannaBeatle David's Photosynth app on his iPhone. For those who don't know, David tends to be the hi-tech pioneer among the WannaBeatles. If it weren't for his influence, we might all be driving horse-drawn carriages to gigs lit by candle light. As we were setting up on this freshly constructed stage, we got to know our sound man Robbie Stokes, a veteran of rock'n'roll who, along with his crew, made us feel right at ease. 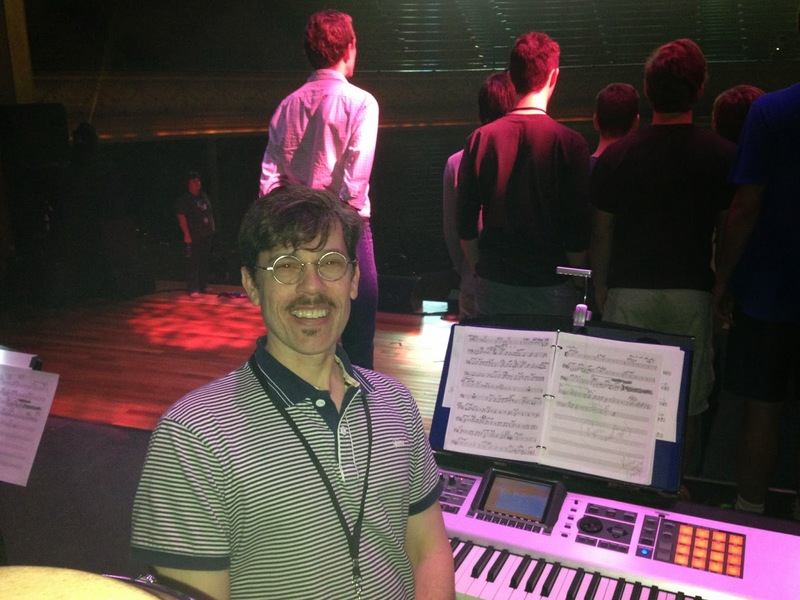 He's a whiz at programming the Yamaha M7 digital console. 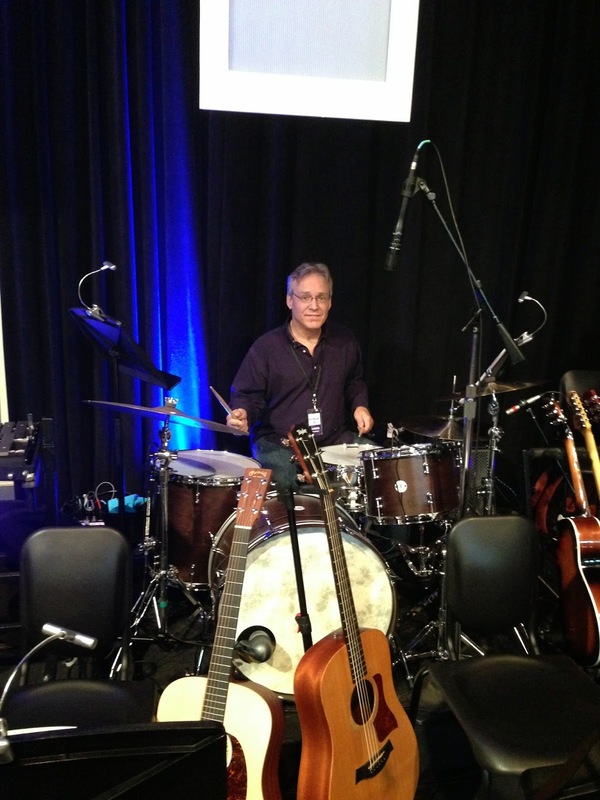 I noticed he used a Heil microphone on the kick drum, which led to a conversation about legendary audio innovator Bob Heil, who's the only sound man, Robbie told me, "inducted into the Rock'n'Roll Hall of Fame." According to Wikipedia, the distinction is more accurately worded as "the first manufacturer invited to display" legendary gear at the Hall. 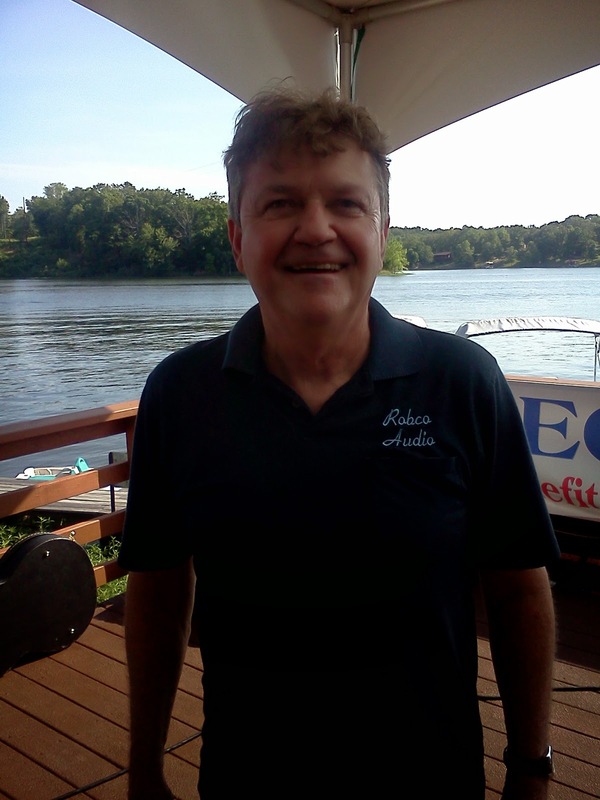 Born and raised in Illinois, Heil started his own sound company in '66, designing and building speaker cabinets, mixing boards, and other components (including microphones, which was news to me). After providing ground-breaking PA for The Grateful Dead, he worked with Joe Walsh to develop the "talk box," giving another one to Peter Frampton. After touring with The Who, he was commissioned by Pete Townsend to create the first Quadrophonic sound system, which was used on their Quadrophenia tour. Robbie is also a Beatles fan, having written and recorded a a song about George Harrison with his son Robby called "Believer." He also made us aware that we were not far from Benton, Ill., known to dedicated Beatles fans as the home of Louise Harrison, George's older sister. In late 1963, during a two week break in The Beatles' schedule, George (virtually unknown in the U.S. at the time) visited Louise in Benton. Nearby Mt. Vernon is the site of the music store where George bought a Rickenbacker electric guitar, which recently sold at auction for $657,000. We went to our cabin to get dressed for the show, and decided to use our new custom tailored summer shirts, patterned after the Shea Stadium suits the Beatles wore in '65. It was our first time wearing them onstage. Sorry we don't have photos of the new shirts. We were served complimentary supper at the restaurant/souvenir shop. We had fresh house salads and two pizzas with home-made ingredients. It was a family affair - Carla and two of her daughters were among the staff bringing out our meal. We learned that Carla has a son Abraham who's a talented painter. 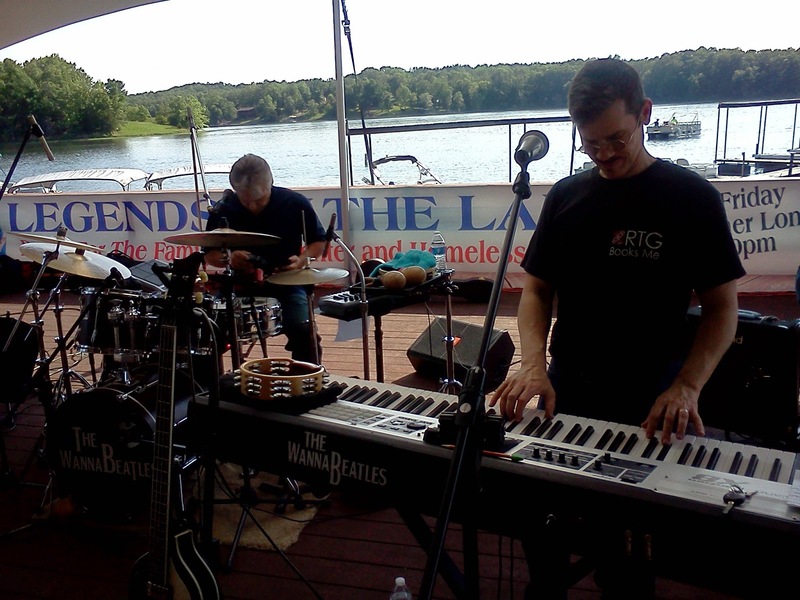 We had a great gig, as the sun went down over the lake. 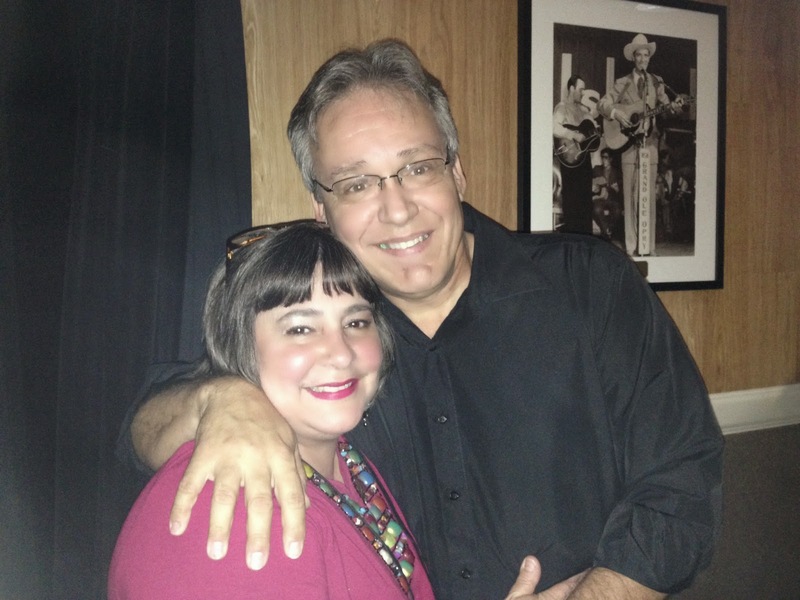 After the show, we met folks and took photos at the merch table, and loaded up the van and trailer. And the hospitality of Egyptian Hills continued, as they offered us ice cream treats - blizzards, floats, with chocolate swirls and pecans, all made with delicious high-fat content ice cream. We returned to our cabin, found our beds, then after the ice cream buzz wore off, we finally fell asleep. 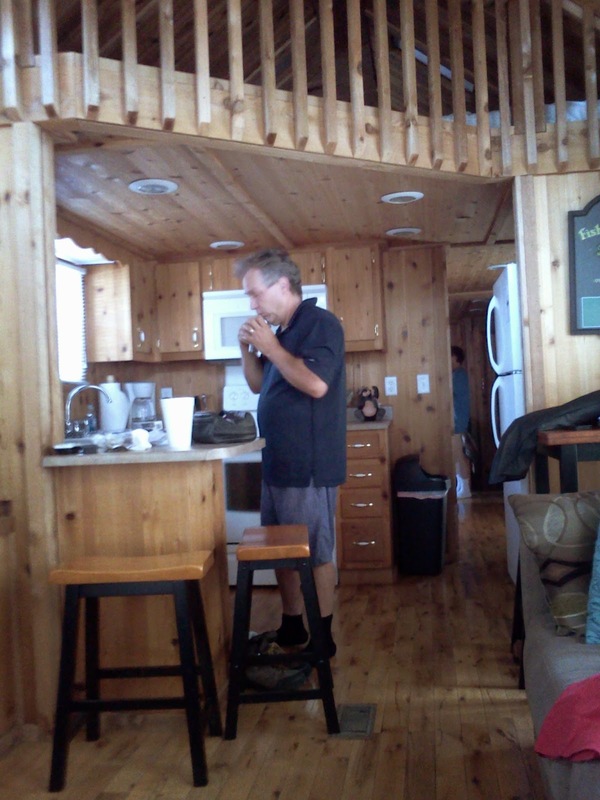 Here's a view of the inside, David shaving in the morning. As we approached our van, we encountered Carla and her youngest daughter Anna and paused for some more photos. Then Carla asked us "Got a minute?" and took us back into the restaurant, where she pulled out a cardboard box full of prints of paintings that her son Abraham had done. We were astounded at the quality. 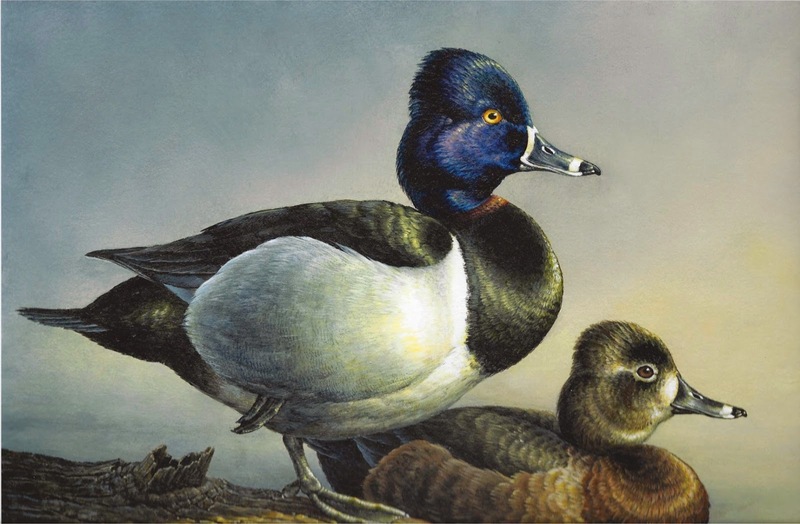 He mainly paints nature scenes, but with exacting detail and realism. Since Carla had extra copies of most of them, she allowed us to choose one for each of us. Nathan and I both chose copies of the same painting. These are portions that would fit into a scanner, of our two different prints of an original oil painting by Abraham Hunter called "Resting Ring-Necks." There's a difference in tone color, but in both the skill of the artist is obvious. He was about 20 when he did this. So that's how we experienced Egyptian Hills Resort - a beautiful place, with lots of people we really enjoyed meeting. The trip began with Sally's new book and and ended with Abraham Hunter's painting, with lots of music in between, at a beautiful lake retreat in southern Illinois - abundant creativity all around us. Micah mentioned our returning next year, and we look forward to it. 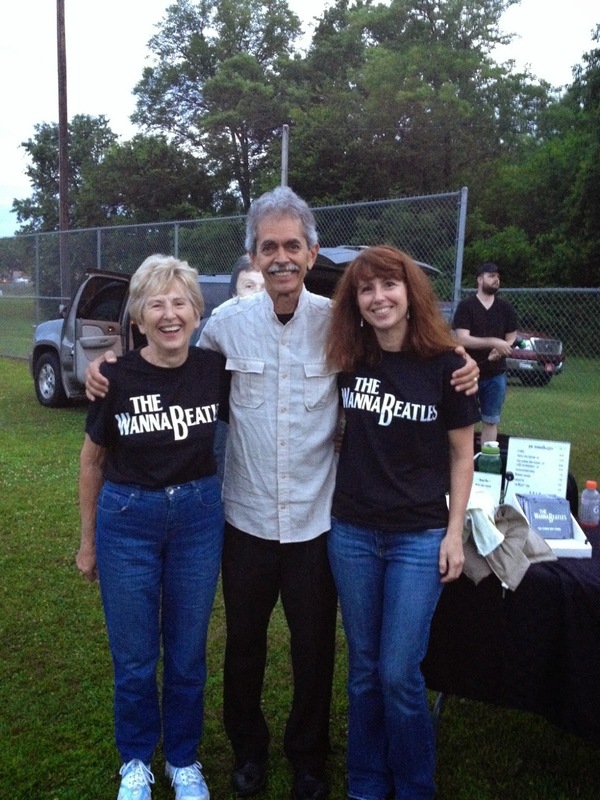 How many WannaBeatles does it take to qualify as a WannaBeatles gig? Well, two out of four makes it worth considering. And a third WannaBeatle present as an audience member raises the quotient to 3, or maybe 2.5, with onstage presence being worth at least half of a full credit. 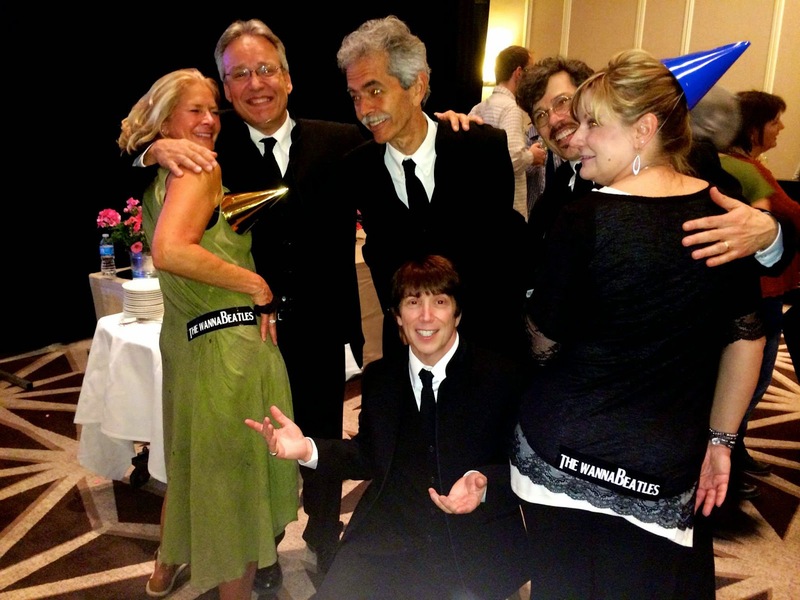 But statistics aside, there was a wonderful and unique evening of music on May 3 as Christ Presbyterian Academy celebrated 29 years of growth by sponsoring a concert at the legendary Ryman auditorium. 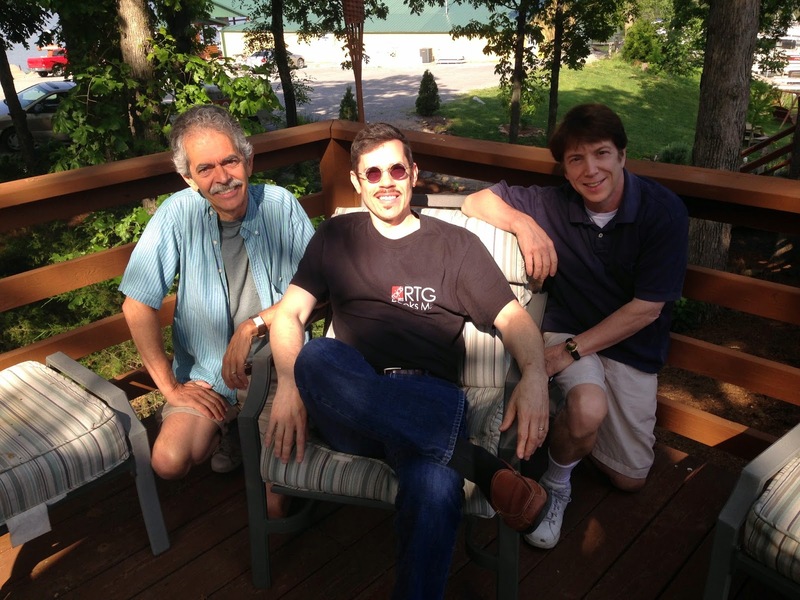 The two WannaBeatles who are connected to CPA are Nathan and David. Nathan is a regular rehearsal pianist for their choir, and the keyboardist for the productions in their drama department. For this particular concert, Nathan also wrote several specific arrangements for the choir. David, whose wife Alice teaches at CPA, and whose three children have all attended the school - and excelled in the drama department - played drums for the show. For both, it was a first opportunity to play at the legendary "mother church of country music." The third WannaBeatle in attendance was me, Bloggin' Bryan, along with my faithful life mate Good Yoko (known to others as Holly.) Nathan had reported to me that one of the surprises that was planned for the concert was that Alan Jackson would appear as a guest artist. This was such a secret, several days before the show, that David didn't even know, and Nathan was deliberately keeping it a secret. But I knew how to make something good out of the news, because Good Yoko is a huge Alan Jackson fan. Part of the story is that Alan Jackson comes from Newnan, Ga. which is only about twenty miles from Fayetteville, the town where Holly grew up, so AJ is a local hero of sorts. The fact that she thinks he looks great in tight jeans is probably a bigger part of the story. So I bought two tickets to the show, and kept it a secret that one of Holly's favorite artists was due to appear. We sat in the famous wooden pews, watching as Stephen Curtis Chapman welcomed the crowd and sang some opening songs. We admired the skills of the singers - both students and recent graduates - who performed a wide variety of material. 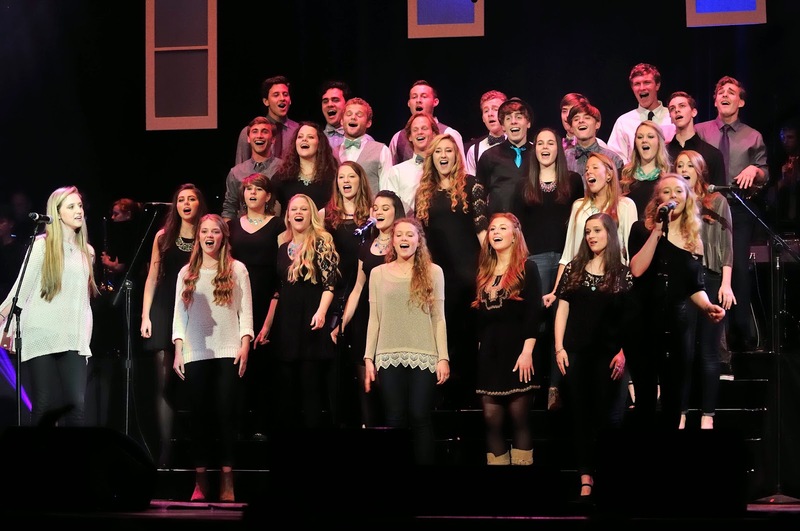 Some of the best music of the night came from "Vision," a specialized choir of CPA students, who performed custom medleys of well-known pop songs, from Elvis and Beatles through the Beach Boys and Simon and Garfunkel. It was a very enjoyable evening, filled with excellent music and the extra joy of seeing our fellow WannaBeatles onstage doing a very professional job of supporting these very talented high school kids. But the personal thrill of the evening came that moment Alan Jackson was announced, Holly turned to me with that great look of excitement, and that was all I wanted. Neither of us had ever seen Alan Jackson before, and while I've admired his records, I never knew what he was like onstage. Well, after this many years of doing it, the man really has it down. He's not a great singer in any technical sense. But he has such a solid persona, and such a deep resonant engaging voice, to go along with his stage presence, that you never doubt for a second that you're seeing and hearing the real deal. He performed with three members of his backup band, as he sat on a stool in his white hat and tight jeans, charming us all. At one point, he said he wasn't sure what songs to play, and paused as if to solicit suggestions from the audience. Holly took that opportunity to yell out "Whipping Post!," revealing her special awareness of the rituals associated with attending Allman Brothers concerts. AJ and Allman Brothers may seem like distant points of the musical compass, but they're both from Georgia, and that says plenty. In fact, Zac Brown, who attended the same high school that Holly did, makes the case for country and rock being friendly cousins as well as anyone. 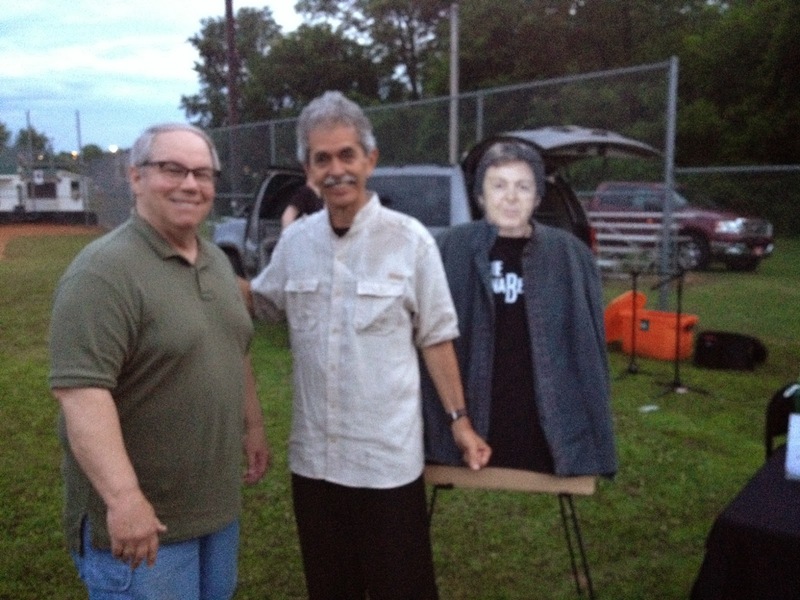 What made the evening even more of a victory for The WannaBeatles was the fact that "Vision," the special choir that performed so many wonderful pop songs, agreed to join us onstage for our annual show at Crockett Park. 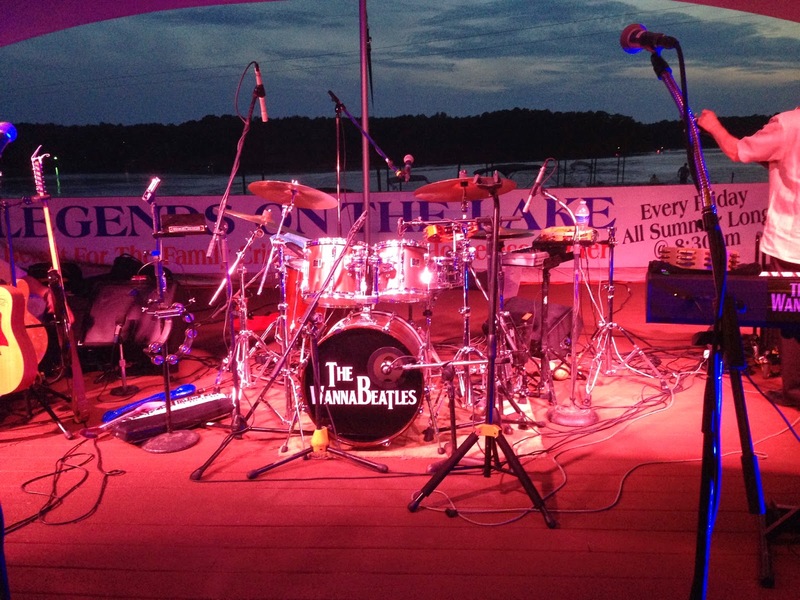 We've already started rehearsing the special Beatles medley to prepare for that show on June 15, at the Eddy Arnold Amphitheater in Brentwood. So, if you missed CPA at the Ryman, bring your picnic to Crockett in a few weeks and enjoy the talent that pours out of that school. 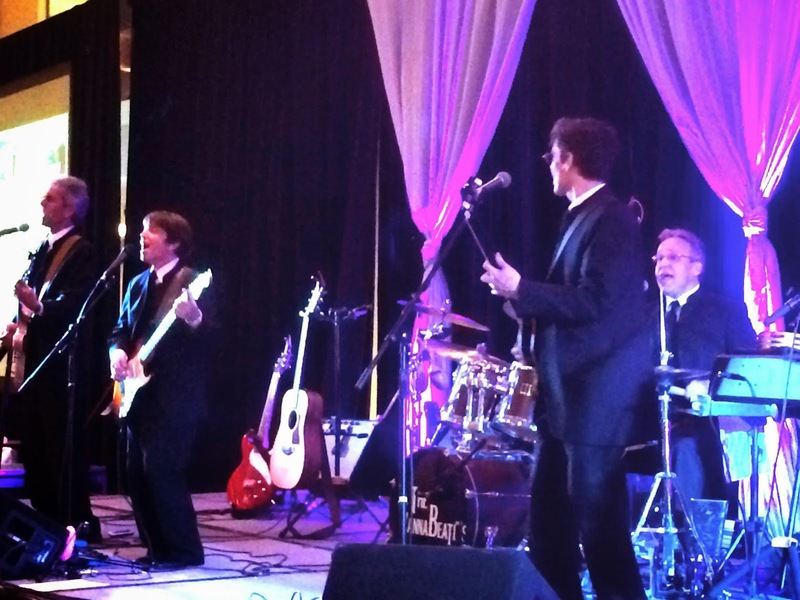 On April 30, The WannaBeatles played for the international conference of Eden Alternative at the Sheraton Hotel in downtown Nashville. Eden Alternative is a global organization devoted to improving quality of life for elders. 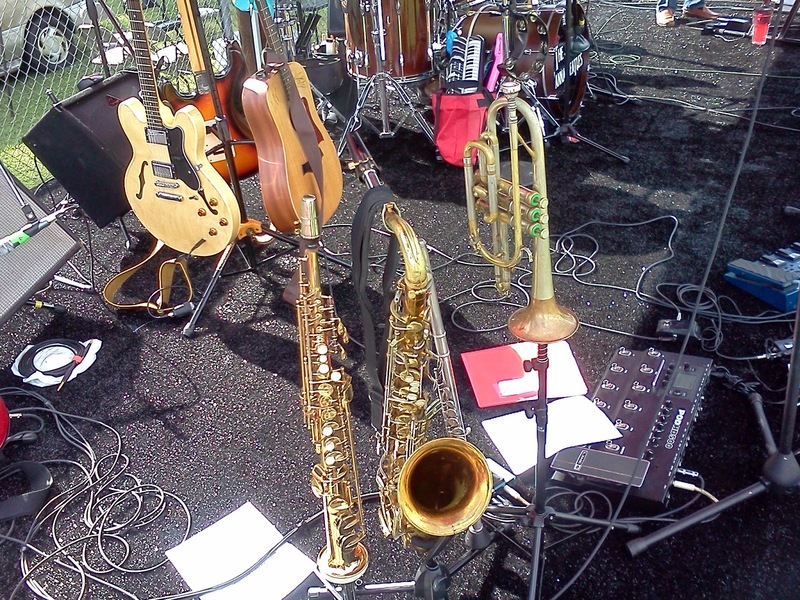 Our friend Laurie Loughlin works with the organization, and last fall when she heard they needed a band for their spring gathering, she recommended us, then kept us informed as the decision made its way through various committees. We were very happy to be the band that played for their opening night. 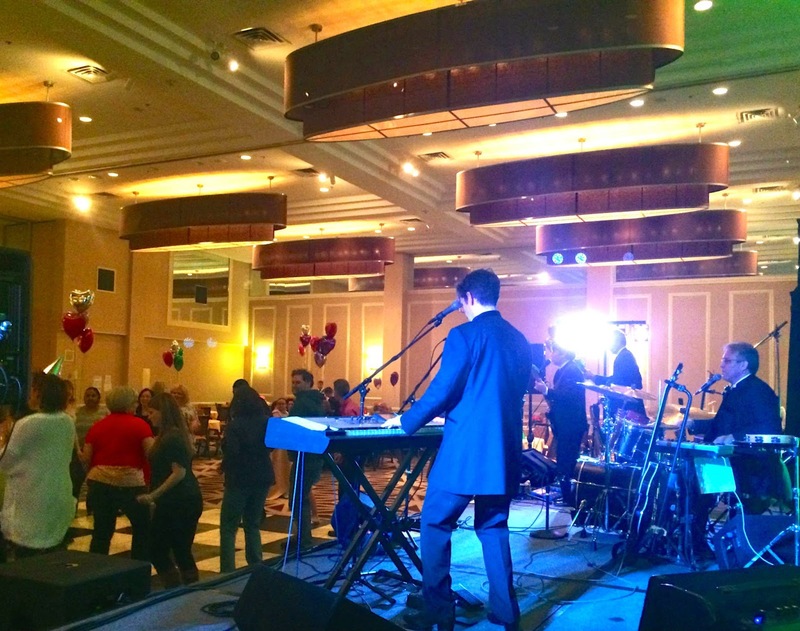 There were many happy people in the ball room listening and dancing to the music that night. Laurie told us that there were members from 9 different countries there, and that the consensus was that we put on "a spectacular show." Music to our ears! Sorry we don't have a photo of Laurie. But we wanna say thanks for a very enjoyable evening!